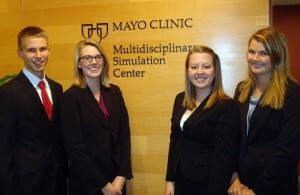 Junior Kyle Radtke, Senior Anna Nelson, Senior Anna Swenson, and Junior Dawn Comstock visit the Mayo Clinic Multidisciplinary Simulation Center as a part of the Mayo Innovation Scholars orientation in October. Very few undergraduate students can say they had the opportunity to further the development of a breakthrough medical innovation years before it was even made known to the medical community. Serving as Mayo Innovation Scholars, Gustavus Adolphus College students Dawn Comstock, Anna Nelson, Kyle Radtke and Anna Swenson are in the midst of doing just that as a part of a special collaboration between select Minnesota private colleges and universities and Mayo Clinic in Rochester, Minn. 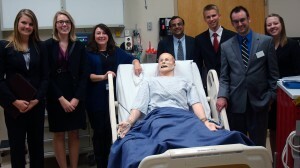 The Mayo Innovation Scholars Program presents elite students with a new product or technology idea that Mayo Clinic physicians and researchers submitted to Mayo Clinic Ventures, and charges them to use research, leadership, and critical thinking skills to explore the feasibility and marketability of the innovation. John Meslow, a retired Medtronic executive, founded the Mayo Innovation Scholars Program in 2006. It all began when he asked Mayo Clinic about how many new product ideas it had awaiting processing and evaluation. Hearing about a high number of unprocessed patents, he saw a need. He said, “We can put together some teams of top students from our private schools to research these new ideas and make recommendations to Mayo Clinic about their potential.” Mayo Clinic agreed, and the program was born. The program receives funding from the Medtronic Foundation and Mayo Clinic. “We get to delve into it a little deeper and think ‘if we were to realistically make this product or enter this market, what would that look like,’” Swenson said. 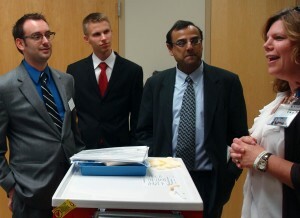 Graduate Student Team Leader Kristoffer Olson, Junior Kyle Radtke, Research Professor Sanjive Qazi in the Mayo Clinic Simulation Center. Beyond becoming knowledgeable about the innovation, students must foresee issues that could prevent the product from being successful in the marketplace. “What’s the business climate? What are the funding opportunities? What are people’s attitudes? They need to get into the mindset of an M.D., if it’s being marketed to an M.D.,” said Faculty Advisor and Research Professor in Biology Sanjive Qazi. The challenge given to this year’s group of Gustavus students at Mayo Clinic this fall is confidential, but Qazi assures that the program focuses students in areas of great relevance. Projects look into innovations in areas such as genomic technologies, medical devices, nanotechnology, targeted drugs, business cases, and medical software. “I really love that it is something significant, and I’m getting to share what I think. Becoming an expert is always really fun. When you’re really fired up about something, it doesn’t feel like work. I think that’s really beautiful, and I think that’s how this project will be,” said Swenson. Students are required to write the book on their innovation – literally. By the end of the year, they will have produced a 30-40 page report about their innovation, without the assistance of a charted path, in addition to preparing a presentation for physicians, lawyers and other health care personnel. “It tests their creativity in a big way. The project is completely ambiguous. There is no set solution. It’s a real life thing,” said Qazi. Junior Dawn Comstock, Senior Anna Nelson, Mayo Project Manager Jackie Arnold, Research Professor Sanjive Qazi, Junior Kyle Radtke, Graduate Student Team Leader Kristoffer Olson, and Senior Anna Swenson at Mayo Clinic. Perhaps what makes this program so unique and innovative is the fact that it brings Gustavus students together from across disciplines to tackle timely issues. “There is no other venture that combines liberal arts colleges with offices of intellectual property in the real world,” said Qazi. While one of the students serving on the team is a biology major and brings a great deal of scientific knowledge, the other three students come with a different perspectives, as economics and accounting majors. “The [biology students] do the research around the technology of the patent. 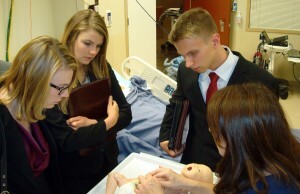 The business students look at the product. They look what it’s doing better than other similar products, they look at weaknesses, or [questions that] need to be [further considered],” said Qazi. 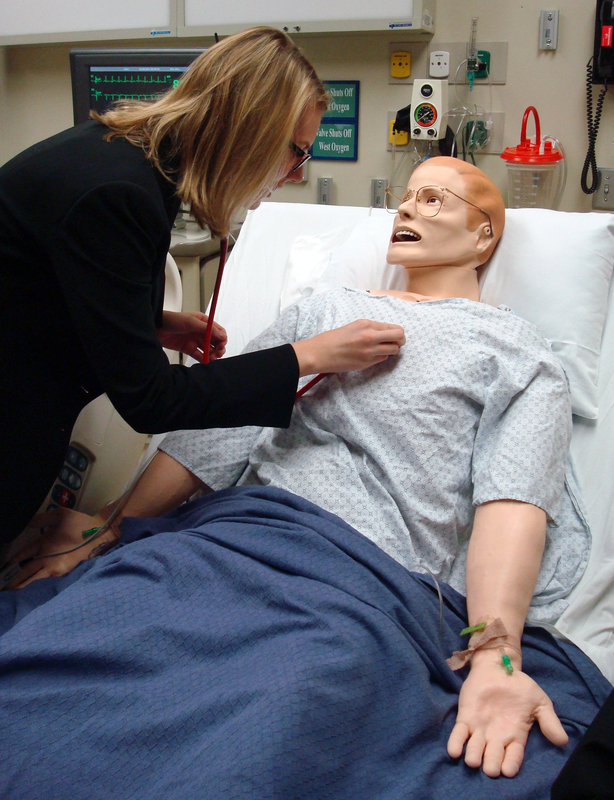 Senior Anna Nelson listens to a mannequin's heartbeat. “They come together with different skills and competencies. 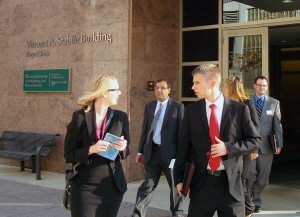 The students have to teach each other,” said Assistant Professor of Management Kathi Tunheim. While Comstock has a great deal of scientific experience, this is challenging her is new ways. “I’ve done research in the past, but its all been laboratory research or focused on one single topic. With this project, it’s more of a broad focus. It’s about understanding the markets and looking at healthcare from a different perspective,” she said. This project will give Swenson the opportunity to share her gifts in a new industry. “As an accounting major, I love the idea that I can be a part of various industries, and still bring my love and expertise to it,” Swenson said. A liberal arts perspective gives students the ability to look at innovation through a number of relevant lenses before it reaches consumers. “Every innovation, at the heart of it, is going to have controversy. You [may be able to] treat [a condition], but you wont make a profit. It begins to bring in larger and larger questions,” Qazi said. In the end, the student’s thoughts and work provide new insight that may have been missed without their diligent effort. “Past experiences have lead students to make contacts with companies that Mayo themselves didn’t think of, or develop new ways of looking at the product that the Mayo licensing manager probably wouldn’t have thought of. The liberal arts setting is an ideal place to seed new connections for a product that looks at it from multiple dimensions not just the product itself,” Qazi said. 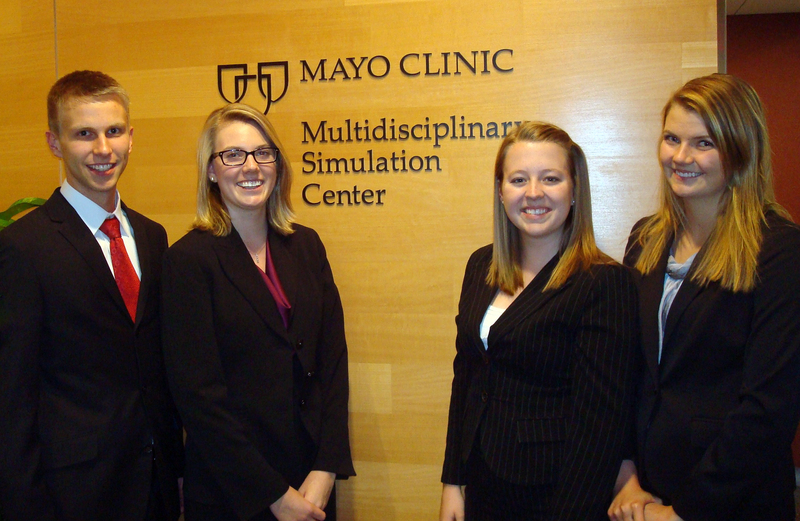 Senior Anna Nelson, Junior Dawn Comstock, Junior Kyle Radtke and Mayo Project Manager Jackie Arnold inside the Mayo Simulation Center. While Gustavus Mayo Innovation Scholars work incredibly hard, typically earning GPAs in the 3.7-3.9 range by the time they are eligible for the program junior or senior year, past experiences at Gustavus are one of the key aspects that prepares scholars for the program. “My different experiences at Gustavus have brought me to the point where I would be able to do this. It’s interesting how my experiences have lead to other experiences. All my experiences are connected to one another. Getting to know the people on campus through my on campus job and Internship really helped me to be a part of the Mayo program,” Swenson said. Swenson had the opportunity to use her accounting skills in a very unexpected way this past summer, leading her to understand how broad interests can lead to unexpected places. “I had an internship with Cargill this summer, where I was learning about the salt industry. I was learning about the different ways to extract salt from the earth. The fact that with business, you can go into these different industries, and bring what you do know and learn about these other [fields],” Swenson said. Comstock comes to the Mayo program with a different set of skills, developed through summer research programs at Gustavus, Syracuse University, and Karolinska University in Stockholm, Sweden. “Gustavus does a good job of providing opportunities for students to be involved in research,” she said. Senior Anna Nelson, Research Professor Sanjive Qazi, Junior Kyle Radtke, Senior Anna Swenson, and Graduate Student Team Leader Kristoffer Olson leave Mayo Clinic. Her research spans different areas of biological study. “I have done bacterial genetics research as well as medical epidemiology and biostatistics. One was looking at bio forming bacteria, because that’s a really big problem in hospitals. The epidemiology was looking back on HPV vaccines and how effective they are. This project is a completely different avenue,” Comstock said. Gustavus professors also play an essential role in leading student research efforts. Professor Qazi’s background in science and business has been extremely valuable as he mentors students in the program. “My background is clinical research on anti-Cancer and anti-HIV drugs. I worked for a non-profit and have a lot of experience analyzing both the scientific and business content of a patent. I, personally, am still involved in the development of an anti-HIV drug. I started that work in 2001 and we barely have it out of animal trials. It’s a big deal, and the marketplace is very competitive,” Qazi said. Meslow feels Qazi is very involved and that he helps facilitate a high-quality product, “He is one of our top faculty members and has done a fabulous job with that team,” he said. “There aren’t that many colleges that get to work directly with Mayo Clinic. It’s a very unique experience, and we’re very fortunate to have it. They stay so focused on not only patient care, but also education and research. It is cool to be involved in an organization that is so well rounded,” Comstock said.